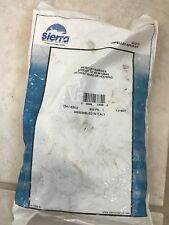 SIERRA Water Pump Kit - CHECK SERIAL NUMBER!, WITH STAINLESS STEEL HOUSING. 40 HP 4-stroke. 45 HP 4-stroke. 50 HP 4-stroke. 60 HP 3 cylinder. 60 HP 4-stroke. ALL OTHERS - CHECK THIS BELOW BEFORE YOU BUY! 6E5-44352-01-00 - IMPELLER (1). 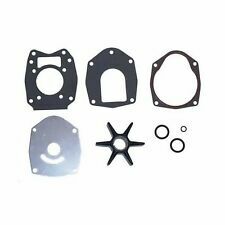 6E5-44315-A0-00 - WATER PUMP GASKET (1). Kit includes Z300TXR 0405. Z300TURD 2005. Z300TURC 2004. Z300TUR 0405. Z250TXRD 2005. 70/75/80/90 hp (3 cyl.). 2-cycle (s/n 0A996142 & above) and 100/115/125 hp (4 cyl.). 2-cycle having pump cover screws without insulators. 75/90/115 hp FourStroke. 60 hp, 2-cycle BigFoot (s/n OD000750 & above). Number of Impeller Blade : 6. 1 X Full Power Plus Impeller 396725. 55 hp 1999 - 2001. 55 hp 1999 - 2005. 40 hp 1999 - 2005. 60 hp 2005. 50 hp 2004 - 2005. 40 hp 1999 - 2001. This impeller has the latest design, engineered plastic hub. for Alpha One Generation 2 models 1991 and up (not Alpha One models 1990 or earlier). Alpha I Gen II Serial No's D494569 and UP. 60 Seapro, Marathon & Bigfoot D000750 & UP. 65 hp (650) (3 CYL.). 4382057 thru 4571651 1976. 35 hp (2 CYL.). 6445653 & Up 1984-1989. 45 hp (4 CYL.). 5531630 & Up 1986-Up. 70 hp (3 CYL.). 4977157 thru 6428680 1979-1983. 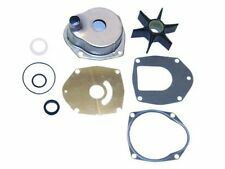 Kit includes impeller, upper water pump housing with water pump cup already installed, impeller wear plate and the necessary gaskets and o-rings. 65 (650) (3 CYL.). 3293184 thru 4571651 1972-1976. 70 (3 CYL.). Impeller Size Impeller weight: Approx. 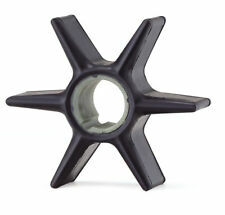 This Impeller may also fits Chrysler Force Application 1 X Full Power Plus Neoprene Impeller. It is designed for the following models For 30/40/45/50/60 4-stroke Bigfoot, 60 (3 cyl.). SKU#: 5001594. 20" 200 / 225DI 1999. 200 / 225 "HG" & "HGL" 2000. 20" 200 / 225 1999. 200 / 225 1986 - 1992. 20" 150 / 175 "GL", "SL", & "SPL" 1996 - 1999. 20" 150 / 175 6V6 1993. 20" 135 V4 2001. Kit includes new impeller, impeller wear plate and o-ring as illustrated. Impeller reference part # 47-89980. Impeller plate reference part #: 46895. 4 hp 1 cylinder 2498136 - 4107219. 4 hp U.S. models 5595532 - 9075838. This is the water pump repair kit for Evinrude Johnson OMC# 394711 0394711 9.9/15 HP Outboard Motors. Cross Ref #: SIERRA 18-3327, 318875, 318999, 319989, 386685, 386697, 386886, 387610, 388139, 389112, 389114, 391388, 391689, 393560, 394711. 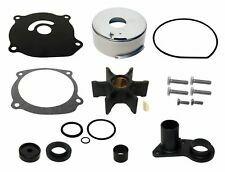 Water pump kit for Johnson and Evinrude V4, V6 and V8 outboards. The kit includes everything except the plastic housing, but it does include the stainless impeller insert that goes into the housing. This is the water pump repair kit for JOHNSON EVINRUDE # 5001594 85/300 HP Outboard Motors. Johnson Evinrude V4 / V6 / V8 1982 - 1992. Johnson Evinrude V4 Cross 20" & 25" Models 1993-1998. Johnson Evinrude 90hp Looper (except SL Model) 1995-2006. 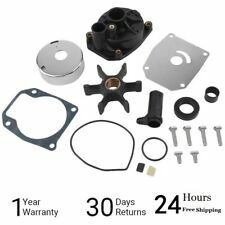 Kit includes impeller, upper water pump housing with water pump cup already installed, water pump base, impeller wear plate and the necessary gaskets and o-rings as illustrated in the image provided to rebuild your water pump. Kit includes new impeller, impeller wear plate, guide tube and o-ring as illustrated. Impeller reference part # 47-89981. Impeller plate reference part #: 46895. 4 hp 1 cylinder 2498136 - 4107219. 4 hp U.S. models 5595532 - 9075838. 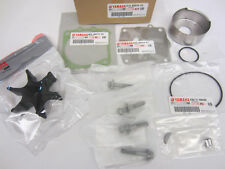 This is the Water Pump Impeller Repair Kit for Yamaha # 63D-W0078-01 40/50/60 Horsepower Outboard Motors. Made of the highest quality hardened nylon and neoprene rubber. FITS THE FOLLOWING YAMAHA OUTBOARD. (Water Pump Impeller Kit for Johnson & Evinrude. 1) Water Pump Impeller (Replaces Part #: 395864, 397131, 435821). 1) Impeller Gasket (Replaces Part #: 324701, 338484). 1) Impeller Key (Replaces Part #: 331107). Replaces OMC Part #: 395270. as detailed in the chart below . does not have a seal in the upper housing, the impeller has a ridge on it which acts as the seal. 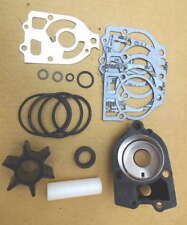 Water Pump Kit with Housing for Johnson & Evinrude. Cheap cheapest low lowest cost price 105hp 135hp 140hp 150hp 175hp 200hp 105 135 140 150 175 200 hp 1985 1986 1987 1988 1989 1990 1991 1992 1993 1994 1995 1996 1997 1998 1999 2000 2001 2002. The weight of each item will be added together when you check out. The kit replaces part number 803062T1. 135 hp 0A904646 & up. 150 hp 0A904646 & up. 175 hp 0C100861 & up. 200 hp 6435503 & up. E175FCXSSV FFI, Elec Start, TNT, 25 IN. shaft, wht, cntr rotate 2000-->GEARCASE - STANDARD ROTATION - FSL, FS, FPX, FX MODELS. E175FCXSSR FFI, Elec Start, TNT, 25 IN. E175FCXSIF FFI, elec start, TNT, 25 in shaft, wht, cntr rotate 2001-->GEARCASE - STANDARD ROTATION - FSL, FS, FPX, FX MODELS. Replaces OMC Part #: 435821, 5001593. Water Pump Impeller for. Johnson & Evinrude V4 & V6. 85 hp 1979 - 1995. 90 hp 1979 & Up. 90 hp SL, DI models 1995 & Up. 100 hp 1979 & Up. 100 hp comm. It includes: Neoprene Impeller, Pin, Gasket, Seal. TM Neoprene Impeller. Water Pump Impeller Service kit was used on Honda Outboard Boat Motor Cooling System Engine Parts Model BF115D/BF135A/BF150A. 1996 BE25ERLED CYLINDER & CRANKCASE 2008 E150HSLSCS CYLINDER & CRANKCASE. 1996 BE15FDLED CYLINDER & CRANKCASE 2008 E150DPXSCR CYLINDER & CRANKCASE. 1996 BE15FAED CYLINDER & CRANKCASE 2008 E150DPXSCR CYLINDER & CRANKCASE. 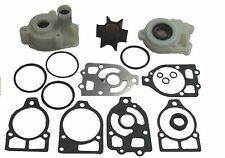 Water pump kit for Johnson and Evinrude outboards 8, 9.9 and 15hp. 15 hp 1974 - 2006 2 stroke. 8 hp 1995 - 2004 4 stroke. 15 hp 1995 - 2001 4 stroke. Replaces: OMC Johnson/Evinrude PN 394711. 15hp Johnson/Evinrude 1974 & Later. 15hp Johnson/Evinrude 4-Stroke 1995 & Later. High quality!Great performance!low price! We have two US overseas warehouses. It includes: Full Power Plus Neoprene Impeller, Wear Plate, Plate Kit, Insert Cup, Water Pump Gasket, Water Seal, Installation bolts and washers. This impeller kit was engineered for top performance.